It's hard to find anyone in the Stick world who's busier than Youenn Landreau. A journeyman musician, Youenn performs and records as a soloist, in duo, trio, quartet and sextet settings, comfortably holding down the rhythm, bass and melody and countermelody roles with equal expertise. While many of the groups he plays with offer new twists on traditional Breton rhythms and melodies, Landreau is also a skilled soloist, as well as one third in the electric multi-media rock trio, Costik. Most often you'll find him recording and touring around France with the Alain Pennec Quartet a unique combination of accordion, Stick, harp and drums. 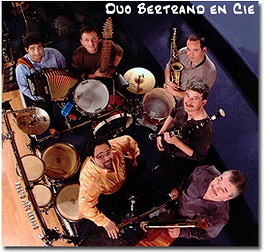 But then he's off to far corners of the globe with the high-energy Duo Bertrand en Cie sextet. 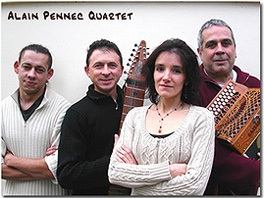 As a major force behind the Association Francaise du Stick et de la Tape Guitar, Youenn has helped create this national organization of French Stick players, with their own website and forum. The association meets every year for the annual Festival of Stick and Tap Guitar in Allaire, a two-night festival that has featured Stick players and other tapping musicians from around the world. Previous headliners have included Guillermo Cides, Splendore, Michael Manring, Preston Reed, Greg Howard Duo, several French artists and last year, Emmett Chapman. As a special performance ensemble for 2005's festival he was joined by fellow Stickists Jim Lampi and Jo Ruffier des Aimes, plus a horn section, percussion and keyboards to form "Groove and Stick". I asked Youenn a few questions in May via email about his recent tours and some of his musical goals. GH: You are playing this unusual instrument in what could be described as a "traditional" setting, with acoustic instruments, playing music with a long heritage. Do you find you have to work harder to be accepted by the audience than other musicians, because to me your playing seems very natural in these settings? YL: I know quite good the traditional music and the dances of our Celtic area, our country "Bretagne". I went a couple of times in Ireland, Breton people love Irish music, and also I appreciate very much music from central Europe, Romania, Yugoslavia, all these musics with a mix between Slavic, Mediterranean and Celtic influences. But I am not playing in a "traditional setting". The bands in which I'm playing are accepting the Stick as they will accept drums or keyboard, in a modern way of arranging traditional music. The most important is to know precisely the traditional music, so that we can respect it, the rhythms, the articulation of the melodies, the dances, and only after this we can go to modern arrangements, proposing sounds and mixing with modern rythms, composing melodies as traditional ones but with modern harmonies, all this... I can say that it is not always well accepted by the audience, and this is the game as I like it: we are constantly making movements to go ahead and get back to the roots, and finaly we are progressing. Our traditional music is not static, it is in permanent evolution. And the Stick in all this? Very often people who don't know anything about trad. music ask me if it is a celtic instrument, sometimes I joke and I answer yes... The bands in which I am playing are asking me to be in this modern side of trad music, and if my "playing seem very natural in these settings", allright, my job is done. I do play the Stick in these musics exactly the same way as I could play accoustic guitar; I was a bass player before so I kept the bass role, and I can play also the melodies and the chords, thank you Emmett, the Stick fits me well. GH: On your recent trip to India, was there a lot of curiosity about The Stick? YL: Oh yes. The whole band was curious for Indian people. But with the Stick, at the end of the concerts, I had always from 5 to 20 persons asking me how it was working. I had to do an improvised conferency to this so kind persons, it made me meet very interesting persons, the woman percussion player Anuradha Pal, and I was also invited to a studio session in Pondichery at Manosh Pradash's place. Very often it was students, young guitar players who were amazed by the Stick. I always told them to go on stick.com to know more about the Stick. GH: You play in so many different groups, do you find that you have to think differently about the music when you are making it, or is there just one "Youenn" attitude. YL: I am not playing the same way at all in the different bands, it depends of the place that I can take in the melodies, the harmonies, the rhythmsand the bass. In Alain Pennec quartet I am playing very much more melodies than in Duo Bertrand and Cie, and sometimes in certain situations I even play only a bass line. Of course I find myself playing often the same kind of arrangements, and somebody told me a few days ago that he heard a recording where I was playing and that there was a "Youenn" sound. GH: I'm really impressed with the AFSTG organization. I can't think of anything like it anywhere else. How many members do you have now? When is the next Allaire Festival, and who will be playing this time? YL: AFSTG, "Association Francaise du Stick et de la Tape Guitare", we are 44 members for the moment. But I know Stick players that are not members of AFSTG, musicians are individual... An association in the french meaning is a free connection between people who have a common goal. In this kind of "association" nobody can earn money personaly, we call it "non lucrative goal association". We use very much these "associations" in the cultural and artistic movements. The AFSTG had a first period in the middle of the 90's. Jo Ruffier was the leader of the Montreuil Festival near Paris (3 editions, 95, 96, 98), and AFSTG was leaded by Pascal Gutman, Thierry Carpentier and Thierry Bedoucha. This first period did stop. When the Allaire people, (Alain Launay of the CLAC that organizes the festival) asked me to organize a festival dedicated to the Stick, I couldn't believe that it could work. But we did it and it worked! After two editions of this festival (that I wanted to be the continuation of the Montreuil festival, but better organized, when I say "better"...) Alain Launay of the CLAC Allaire told us that the festival needed the Stick players to be more involved, and it was the rebirth of AFSTG. Since this rebirth AFSTG is very better organized and internet helps us very much to communicate. During the Allaire festival, AFSTG is the organizer of the Stick seminar while CLAC Allaire organizes the concerts. Next Allare festival will be in November 2006, the 2nd and the 3rd for the Stick seminar, the 3rd and the 4th for the festival. 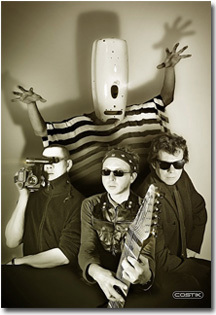 As we had a "creation" in 2005, we asked Ron Baggerman to be the leader of a new creation called "Soul Stick", with Pascal Gutman also on the Stick and Rob Van der Loo on Stick, bass and guitar. They'll have Stephane Barbier on drums and Amandine Cachinho as singer and piano playing. Ron's friend Frank Leurs will also sing a few songs. We'll also have Tom Griebsgraber and Jerry Marotta, a Stick and singing concert with Olivier Chabasse, and a special white card to the AFSTG. GH: What is the tuning you are using, and do you have some favorite amplification equipment you like to use? Your sound is very clear, even when there's a lot going on with harp and accordion, etc. YL: I had first a iron wood Stick from the first generation, after I had a polycarbonate one, both were tuned standard. Since 1995 I have a vey good teak 12 grand, a 7/5 tuned standard with two more lower 4th for the high strings side ; for 3 years now I play in Matched Reciprocal tuning, the same as before but just one tone lower for the high strings. 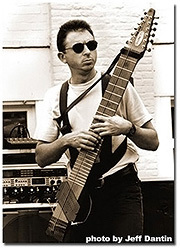 I like verymuch this 7/5 Grand Stick, I know that now I would buy a 6/6 if I had to get a new Stick but I will never separate with my 7/5 that allows me to play very low with the high strings, and the Matched reciproqual tuning gives me more place between the two hands ; we all think about uncrossing the strings but we know that the ergonomy of this crossed strings is very convinient. One Gold Channel preamplifier, it is a totaly numeric treatement but so precise (by example I can use a dynamic equaliser, to absorb the "Bhooo" of the lower bass string when it is played in the middle of the neck, without modifying the sound when I play oher notes), with a very soft compression, a little bit of brightness, and a noise gate per channel to mute the sound when I do not play. One Fireworks multi effects rack, I like the possibilities of this effect, I studied a personal internal routing to play reverb and delay on high strings or on the whole strings, I also use saturation and strange effects but most of the time I play with natural sound. I also use a pedal board with a foot controler, I pilot the parameters of the Fireworks with it. My special routing makes that the outputs are separate, left for bass and right for high strings, so to connect with a sound system, the sound engeneer can have the possibility to adjust the level of the two strings sides. I use a personal amplification, a little mixing desk and a LEM sound system not too heavy, with a subwoofer and two high satellites, it is difficult to trust the stage monitors which are different at each concert, and when I have to rehearsal with drums and a full sound orchestra I have to get my own good sound. You say that my sound is clear, but I think that it comes from my playing on the instrument, even when I play with other systems than my TC racks I have a similar sound. You are yourself very often talking about the engagement of the Stick player on his instrument, I agree. If the sound is clear even with the accordeon and the harp, it is because I'm always trying to differenciate the highness of the musical parts. GH: What is the next recording you hope to have released? YL: We are recording soon a CD for a young singer (not traditional music at all), Soane, she sings her composed songs, we biggin on monday the 19th of june, for two weeks with concerts with other bands at the same time, hard work this month... We will have to record a new CD with Duo Bertrand en Cie in 2007, this band is very well managed by Sebastien Bertrand, the accordeon player. And as I was saying, I need to work on a personal project, I have to find time for this. I will soon have my personal website, I'll give news. To finish, a personal message: never play too heavy on your Stick, we have to keep reserve of dynamic, so if you want to play louder, increase the volume and play soft. GH: Thanks for your time and for all the music you're making and the support for The Stick community in France. YL: Thank you Greg, and thanks to Emmett to create the Stick, it gives us happiness. 4th Alain Pennec Quartet with "Lorient Jazz Big Band" during the famous "Festival Interceltique de Lorient"
15th Alain Pennec Quartet, Vannes in Brittany. 18th Alain Pennec Quartet at Onyx concert hall in Nantes, "Celtomania Festival"